When Ozark received some new route awards on 9 December 1958, in the decisions in the Seven States Area Case, the time seemed ripe to supplement the old DC-3s with modern feeder airliners. A selection committee chose the Dutch 40- seat Fokker F-27, powered by Rolls-Royce Dart turboprop engines, and put them into service on 4 January 1960. With traffic growing healthily, more ‘DC-3 Replacements’ were required, and the first Convair 240 piston-engined 40-seater went into service on 14 August 1962. The Convairs did not stay long. In an ingenious solution to equipment problems, Ozark and Mohawk Airlines filed jointly with the C. A.B. for approval of an exchange of air­craft: Ozark took eight of Mohawk’s Martins for four of its Convairs, thus standardizing both fleets. The C. A.B. acted swiftly, and the first Martin 404 entered Ozark service on 1 December 1964. During this time, Laddie Hamilton, Ozark’s founder, resigned on 6 August 1959, and Joseph Fitzgerald took over as president, He too resigned on 30 July 1963, and Thomas L. Grace was appointed president on 18 February 1964. He was to guide Ozark into the Jet Age, was elected chairman of the board on 21 August 1970, but died on 21 July 1971, just before the death of founder Hamilton three months later. Ex-Charlotte Aircraft Corp. (FH) 4 Aug 67. Notes: (FH) = Sold to Fairchild-Hiller Corp. All except N456A (ex-Charlotte Aircraft Corp.) were ex-Mohawk Airlines. 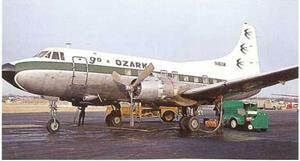 As mentioned on page 94, Ozark Air Lines moved with the times and began to retire its old DC-3s, trustworthy and reli­able though they were, simply because the Jet Age had arrived and the trunk airlines were all rushing to upgrade their fleets with Boeing 707s and Douglas DC-8s on their premier routes, and introducing ВАС One-Elevens and Douglas DC-9s on their secondary routes. The travelling public was beginning to look askance at any airliners that still had pro­pellers. The Local Service airlines, whose networks now reached beyond the boondocks into the big cities, had to ‘keep up with the Joneses.’ The answer was a compromise: turbine power (which the publicists could refer to as jet power) with jet engines that drove propellers, and called turboprops or propjets. Of all the Rolls-Royce Dart-engined turboprop airliners, the Fokker F-27 had a head-start on the competitors, the Avro 748, the Handley Page Herald, and the Nihon YS-11. More than 600 of all types were sold world-wide. Ozark put them into service on 4 January 1960 and six years later, with bur­geoning traffic demand on all fronts, ordered the U. S. license – built development, the Fairchild-Hiller FH-227. 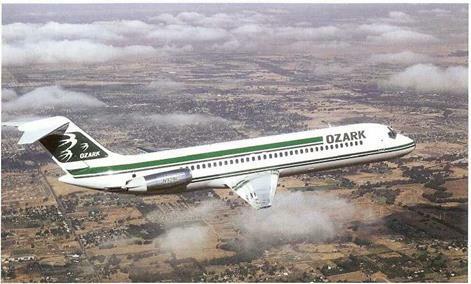 Ozark had increased its capital by $12 million to finance this order, as well as one for more Douglas DC-9 jets, which went into service during the same year (see page 96). The first FH-227 schedule was on 19 December 1966. On 26 October 1968, the veteran Douglas DC-3 fleet was retired, and this included one of the earliest off the production line (as noted on page 93), originally a DST that had logged 65,000 hours in flying time. 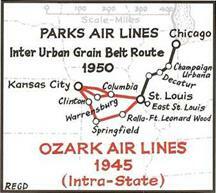 The last revenue service was from St. Louis to Kansas City, and from then onwards, the Ozark Air Lines fleet was all turbine-powered. The stretched FH-227featured three more cabin windows than the standard F-27 from which it was derived. One of Ozark’s DC-9-34s over the grid-patterned fields of the Midwest. 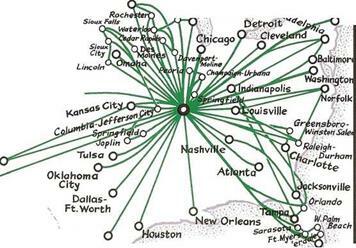 This series of maps dearly illustrates Ozark’s transition from local service to regional airline status. Merged with TWA, 26 Oct 86. Returned to lessor, 20 Apr 00. Ex-Swissair, ex-Air Panama, ex-Douglas. Sold TIA, 28 Mar 74. 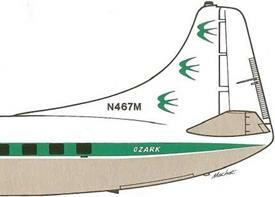 Ex-Standard Airways, ex-Ozark Air Lines. Sold to Douglas Aircraft, 29 Oct 74. Ex-Saudia. Leased to and returned LAV, 8 Aug 75 to 15 Oct 76. 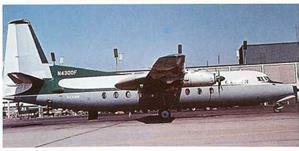 Leased to and returned Southern Airways, 10 Sep 77 to 1 Jun 78. Returned to lessor, 20 Apr 00. Leased to and returned Air West, 12 Mar 68 to 16 Oct 68. Crashed after aborted take-off Sioux City, Iowa, 27 Dec 68. Crashed after hitting a snowplow during take-off, Sioux Falls, SD. 21 Dec 83. Sold to Aviations Sales Company Inc., Jun 84. Leased to Allegheny Airlines, 18 Feb /4 to 14 Feb /6.